The ancient Greeks may have used this to cure hydrophobia. English garden cultivation since 1710. American garden cultivation since 1700’s. Grown by Washington at Mount Vernon. Recommended by Gertrude Jekyll in 1908. In early summer loose spikes bear big blue blossoms which turn to large black seed pods. Four foot tall foliage resembles a shrub. Native: Eastern United States, Wisconsin native. 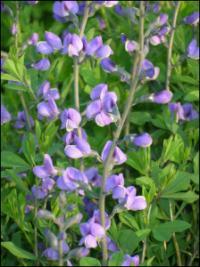 As its common name describes, this plant was used as a substitute for indigo dye. 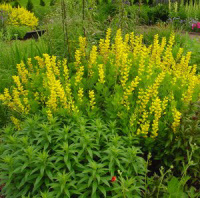 Horticultural greats Bailey, Breck and Robinson considered Baptisia handsome. Introduced in 1758. Spikes of yellow pea-like flowers, a legume, in spring. 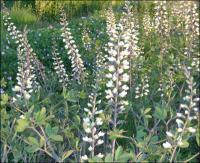 Baptisia is Greek meaning “to dye” referring to use of Baptisia australis as a substitute for indigo dye. Sphaerocarpa means “round seed.” Collected by English planthunter Thomas Nuttall before 1834.